I’ve written several times on how to hit fades and draws, and this one is probably my best post on the subject. There are other ways to get this done, though, and you should be acquainted with a few of them. The ones I am going to talk about today involve the hands. Let’s review the problem to be solved. To fade, the clubface must be open to the swing path. To draw, the clubface must be closed to the swing path. Here are several ways to get that done with your hands alone. 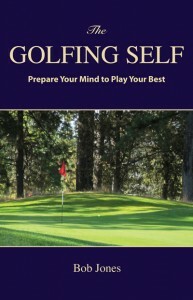 When you set up, your right palm (left palm for left-handed golfers) faces a certain direction, and you can feel the orientation of that palm against the club and in relation to the other hand. I wrote about this a few weeks ago. When you take the club back and through and that feeling of orientation doesn’t change, you will hit a straight shot, all things being equal. To hit a draw, feel like your palm has turned toward the other hand just a little bit as you bring the club into impact. That “just a little bit” part is important. Don’t overdo it. To hit a fade, do the opposite. Feel as if the right palm has turned away from from the other hand and you come into the ball. Note: this does not mean the hands have gotten closer together or separated. They stay as united as they were at address. If you have feeling of the palm having moved, you will get it right. If you actually move the palm, you will overdo it and hit a slice or a hook, which you don’t want. Another way to get this done is by altering the orientation of your hands during the takeaway. When you take the club away, your forearms naturally rotate. Retard the rotation slightly and the clubface closes. Over-rotate slightly from normal and the clubface opens. From there, hold that orientation throughout the backswing and forward into the ball. A third way is a different way of looking at the first way. To draw, turn your right palm down as the club comes into the ball. To fade, turn the right palm upward. A fourth way is entirely mental and relies on giving your unconscious mind instructions and then staying out of its way as it tells your body what to do. If you look at your hands as they approach impact, the right palm faces somewhat upward, squares up at impact, and appears to turn and face downward following through. It is as if your hands are rotating. They aren’t, though. It’s the forearms that are rotating, but you get the idea. To fade, think about delaying the rotation until a touch after impact. That will leave the clubface open at impact. To draw, think about rotating a tiny bit early. The clubface will then be closed at impact. A fifth way is to swing back normally, and on the forward swing, to fade, think of the heel of the clubhead leading the clubface into the ball. To draw, think of the toe of the clubhead leading the clubface into the ball. These thoughts will be felt in a subtle movement of the right hand of which there is no need to control deliberately. The shift will happen by itself and hopefully give you a controllable amount of curve. Five ways to think about working the ball. Five ways of saying the same thing, probably. Pick one and work on it. The benefit of these methods is that you can use the same setup and the same swing and still be able to move the ball. 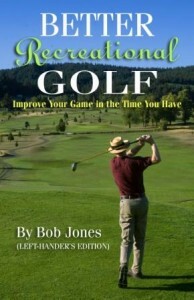 The more things you do that are the same, the easier golf is. But to do something different with the ball, you have to change something that you do, which means you have to practice until you own that change. 1. I have this problem with hooking the ball off the tee. Not the classic draw that all the pros say recreational players should learn how to hit. It’s more like a hook that looks like it’s turning down even as it’s rising off the ground, if it even gets that high. Low left, aim at the right edge of the fairway and hope it doesn’t run out into the rough on the other side. All in all, a useless shot, and I’ve had enough. If this shot is yours, too, pay attention. I teed the ball lower, aimed a bit left, squared the clubface to my aim line, and took the club back a bit outside. I brought it into the ball a bit outside, too. Not a lot, a bit. It doesn’t take much of a change in impact geometry to make a big difference. The result is a shot that takes off along the aim line, gets good elevation, turns a bit to the right and stays in the fairway. Love that last bit. And it stayed in, shot after shot. Try this if low, running hooks with your driver are making you crazy. 2. They say “14 clubs, one swing.” (Well, maybe not your putter.) I don’t agree. The swing I described to you above works with my hybrid irons, too, but not with my irons, especially my short irons. The swing I find more productive with those clubs is my standard swing, which brings the clubhead into the ball low and on line. I can keep the clubface square with my irons more easily than with the longer clubs, so it all works out. That means I have two swings, one for the big-headed clubs, and another for the small-headed clubs. 3. Want to know how to hit that wedge shot that flies low into the green, bites once, and stops? It’s easy. Hit it with a sand wedge by taking the clubhead back very low and letting the wrists hinge. As the clubhead comes back into the ball, let the wrists hinge back to where they were at address as you meet the ball, but at that point arrest the hinging. Keep the back of the left hand in a straight line with the left arm as you follow through. Important! Keep the clubhead very low in the follow-through, and keep the clubface aimed at your target. Do not let it rotate over. All this will put lots of spin on the ball. It will hit and stop within a few feet of where it lands. Use this shot if you have to chip from, say, twenty yards to a pin in front with no room for roll-out. You get that a lot, and if you can hit this shot, you’ll get up and down at last. Ansel Adams (click the link to get a Google search, then click the Images link on that page) was a legendary American photographer of the mid-20th century. His breathtaking landscape photographs set standards that few have met and none exceeded. He was a virtuoso artist whose medium was the photograph. Behind the beauty of every photograph he released, though, was a master of the photographic craft. Most of the dramatic prints he made were photographs of fairly mundane scenes. But Adams knew, before he pressed the shutter, that if he gave this much exposure to the scene on this kind of film, and developed the film with this kind of developer, and printed it on this kind of paper using this kind of print developer, and by manipulating the heck out of the negative while he made the print, he would produce a masterwork. Because he had mastered the technical side of photography, he could concentrate on the art of photography: choosing just the right the subject and framing the shot just right. Golf is the same way. If you have done your homework on the range, you will know in any given situation which club to use, and which setup and swing variables to select in order to hit just the right shot for the situation you’re in. For example, consider the short pitches from 25 to 60 yards. 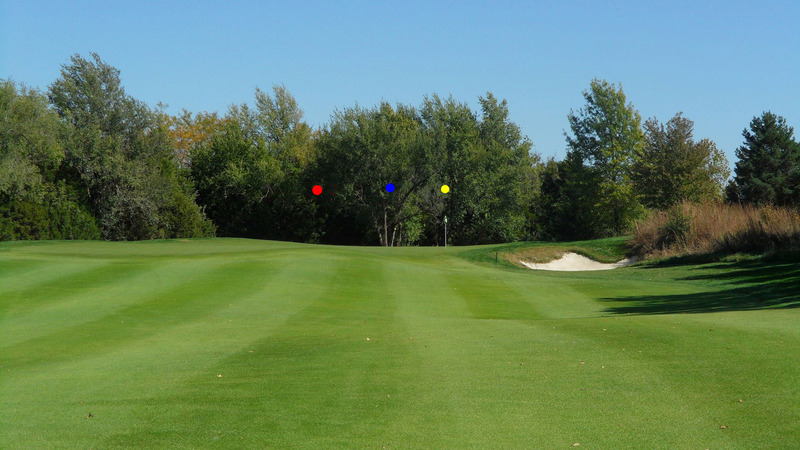 The main course variables are the distance from your ball to the edge of the green, and from the edge to the pin. If you have truly learned how to hit these shots, then for any combination of these two distances, you will know without thinking which club to use, and which setup and swing variables to tack on. Then you can concentrate on the feel of the situation and have the clear mind necessary to pull off all that technique. When you’re trying to figure out the technique for the shot at the same time you’re trying to keep your mind focused, you won’t be able to accomplish either one. A few years ago I saw Retief Goosen on TV hitting from about seventy yards to the right of the green, in front of the one on the neighboring fairway. He had little green to work with, and the shot was blind because he had to hit over a cluster of trees. He flew the trees and stopped the ball inside six feet from the pin. Don’t tell me that was lucky. He knew from his practice exactly how to hit that shot. The more technical shot-making skills you can develop on the practice ground, the easier this game gets and the better you will play. Note: The September Recreational Golfer Newsletter will be published this Saturday, September 1. To have it sent to you, please sign up at my home page. When you have a shot from the tee or from the fairway, there are four things you can do with the ball. A shot-maker will consider all of them. 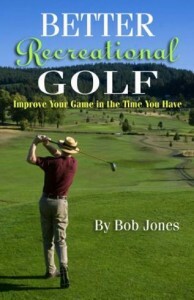 They are the parameters of shot-making which, when mastered, turn golf into a whole new game. They are direction, distance, trajectory, and curvature. Direction seems obvious. There’s the fairway, or the green, so hit the ball in that direction. You know there’s more to it than that. 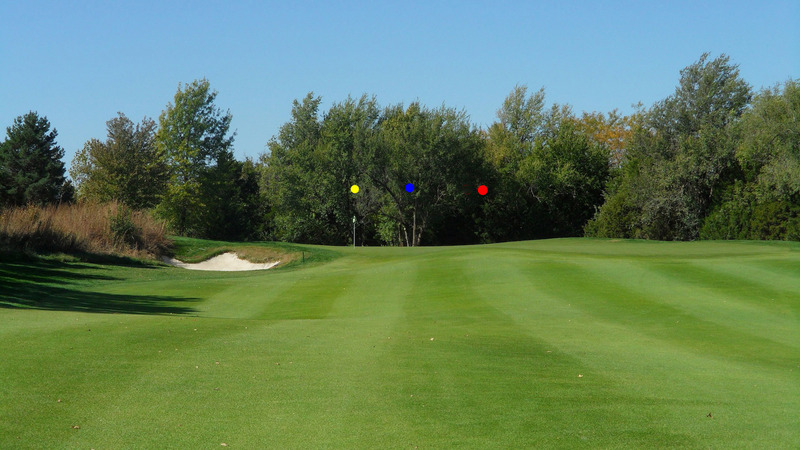 Which side of the fairway do you want to hit? Do you go for the pin or give it room because of disaster lurking nearby? Distance seems obvious, too, but there’s a great deal of finesse in a shot to a pin 170 yards away. Do you want the ball to land hole-high and stop, or land short and release? Maybe you want the ball to fly beyond the hole. Only one of those shots will go 170 yards. From the tee, it’s the same story. The driver is not meant for you to hit the ball as far as you can. It’s meant to put the ball in a certain place in the fairway. We start driving the ball consistently well when we pick a distance and try to drive the ball that same distance every time. Trajectory controls placement of the ball upon landing. Pin in front, hit a high shot to the pin that stops. Pin in back, hit a low shot the center of the green that runs to the back. If there’s wind, you need to keep the ball low to give the wind less control of the ball, and you, more. Curvature is something most golfers have no problem with other than it’s the wrong curvature at the wrong time. Once you learn to hit the ball straight, then you can play with curvature at will to maneuver the ball around the course when needed. You don’t have to curve the ball very often, though. Nine times out of ten, a straight shot will do. But if you have to hit the ball around something, or there’s a tucked pin you can get to, give it a go. Admittedly, some of these parameters involve advanced shot-making skills. The only way to learn those skills, though, is to see the need and start developing them based on real-life situations you face every time you play. When the motivation to learn the shot is a real-life problem, you will learn faster, and better.